MIELE PG8166 Dishwasher from Gillmans Commercial Appliances. The PG 8166 is a front loading tank dishwasher. It is always ready to run because the temperature of the wash water is held at 65degC. The final rinse is then carried out at a variable temperature of up to 85degC. 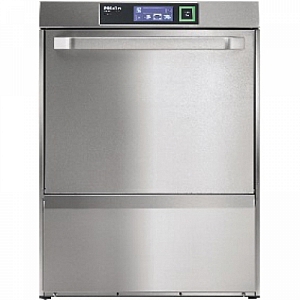 The PG 8166 has a large wash cabinet which offers ample room for pots pans and trays. With a running time of only 55 seconds per load the PG 8166 commercial dishwasher has a cleaning capacity of 1188 plates per hour.